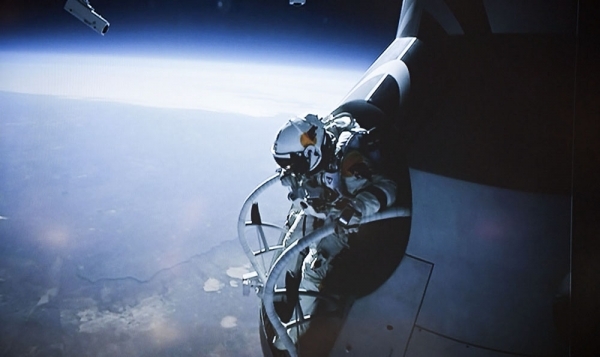 Felix Baumgartner right before his successful test jump (Credits: Red Bull Stratos). THURSDAY 15th MARCH 2012 – ROSWELL, NEW MEXICO USA: Felix Baumgartner, the Austrian BASE jumper aiming to break the world freefall record by jumping from 120,000ft (36,576 meters) bove the earth’s surface, moved a step closer to achieving his dream today after the successful completion of a test flight from 71,581 ft. (21,818 metres). Still-to-be-confirmed figures indicate that at 09:40am MT after an ascent lasting about 1 hour and 30 minutes at a rate reaching speeds of 1,200 ft. per minute, the Red Bull Stratos capsule and a modified version of the balloon reached its top manned altitude of 71,581 ft. above the earth’s surface. The height of Felix’s test flight was significant as it was the first time he passed the Armstrong Line of approximately 63,000ft, where the atmospheric pressure truly tests Felix’s custom- made space suit. Felix then ran through his 39-step safety checklist before manually depressurizing the capsule, opening the door and stepping off the external platform. Felix reached a top speed of 364.4 miles per hour (586.44 km per hour) and continued to freefall for a total of three minutes and 43 seconds. Felix then deployed his parachute at 7,890 ft. (2,404.872 meters) above sea level before landing safely back on earth about 30 miles (48 km) from the original launch site. Felix spent a total of about eight minutes and eight seconds in the air from launch to touchdown. Upon landing, Felix was met by a retrieval team who gave him a thorough medical check before transporting him back to the launch site. Once Felix was safely retrieved, Mission Control triggered the release of the balloon from the capsule and both returned back to earth for technical evaluation. The successful test flight marks a significant milestone in the development of the project, as it offered the team the opportunity to test Felix’s reaction to the dangers and hazards he is likely to face during his record attempt. As well as crossing the Armstrong Line, the test allowed Felix to freefall from twice the height of his own personal record of 30,000 ft (9144 mt) and allowed him to put into practice strategies that he has devised to cope with the inherent hazards of the flight. The test flight also allowed Felix to experience rapid acceleration during freefall, the first time he has experienced these conditions at such altitude. As well as preparing Felix for the conditions he is likely to experience during the record attempt, Felix’s suit, capsule and balloon were also exposed to the elements that they will have to withstand during the record attempt. The first 1,000 feet (304 meters) of the ascent allowed the Red Bull Stratos team to ensure that the initial launch from earth was successful with the entire 71,581ft. flight allowing the technical team to observe how Felix’s suit and capsule performed in temperatures as low as minus 94 degrees F (70 degrees C). Felix Baumgartner is preparing to try and break Joe Kittinger’s 52-year-old record for the highest freefall when he jumps from 120,000 ft (36,576 mt) above the earth’s surface. Felix’s world record attempt will take place in Roswell, New Mexico and is currently scheduled to take place in the summer of 2012.